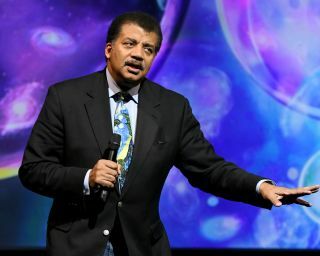 Astrophysicist Neil deGrasse Tyson speaks on stage during the Onward18 Conference in New York City on Oct. 23, 2018. This story was updated at 7:45 p.m. EST. The Fox Broadcasting Company and the producers of the science-based series "Cosmos" are investigating host Neil deGrasse Tyson following claims of sexual misconduct by three women. The move follows a report on the claims by the religion website Patheos. In a statement provided to Space.com "Cosmos" producers said: "The credo at the heart of Cosmos is to follow the evidence wherever it leads. The producers of Cosmos can do no less in this situation. We are committed to a thorough investigation of this matter and to act accordingly as soon as it is concluded." Fox Broadcasting also issued a statement, citing its own effort to look into the allegations: "We have only just become aware of the recent allegations regarding Neil deGrasse Tyson. We take these matters very seriously and we are reviewing the recent reports." The statements by Fox and Cosmos producers follow a report on Patheos Thursday (Nov. 29) in which two women claimed deGrasse Tyson acted inappropriately during personal interactions. In one, Katelyn Allers, an associate professor of astronomy and physics at Bucknell University in Pennsylvania, claimed Tyson inappropriately touched her in 2009 while admiring a space tattoo on her upper left arm. Another woman, Ashley Watson, claimed that she quit a position as Tyson's assistant due to inappropriate sexual advances. Those claims follow an earlier allegation by musician Tchiya Amet, who claimed Tyson raped her while both attended graduate school. On Saturday (Dec. 1), Tyson issued a lengthy response to the allegations on Facebook in a post entitled "On Being Accused." In the post, Tyson offered detailed accounts of the encounters referred to in the allegations by Allers, Watson and Amet. "In any claim, evidence matters. Evidence always matters," Tyson wrote. "But what happens when it's just one person's word against another's, and the stories don't agree? That's when people tend to pass judgment on who is more credible than whom. And that's when an impartial investigation can best serve the truth – and would have my full cooperation to do so." Tyson said in his statement that the alleged groping of Allers in 2009 was an attempt to see if the solar system tattoo extended to her upper shoulder to include Pluto. Watson, he said, was assigned to him as a production assistant this past summer and departed after an evening of wine and cheese that ended in a handshake. Tyson said that when Watson later told him the evening made her uncomfortable, he apologized and she accepted his apology. Of Amet, Tyson said the two dated briefly in graduate school, but denied ever assaulting her. Tyson added that he welcomes the inquiry into the claims by Fox and National Geographic. "I'm the accused, so why believe anything I say? Why believe me at all?" he wrote. "That brings us back to the value of an independent investigation, which FOX/NatGeo (the networks on which Cosmos and StarTalk air) announced that they will conduct. I welcome this." Tyson, an astrophysicist, hosted the 2014 series "Cosmos: A Spacetime Odyssey" as a reboot of the original "Cosmos: A Personal Journey," hosted by famed astronomer Carl Sagan. The updated series aired on Fox and the National Geographic Channel, with a new series — "Cosmos: Possible Worlds " — scheduled to premiere in spring of 2019. Tyson's "StarTalk" science talk show also appears on the National Geographic Channel. Editor's note: This story was updated at 7:45 p.m. EST to include a statement of response by Neil deGrasse Tyson.